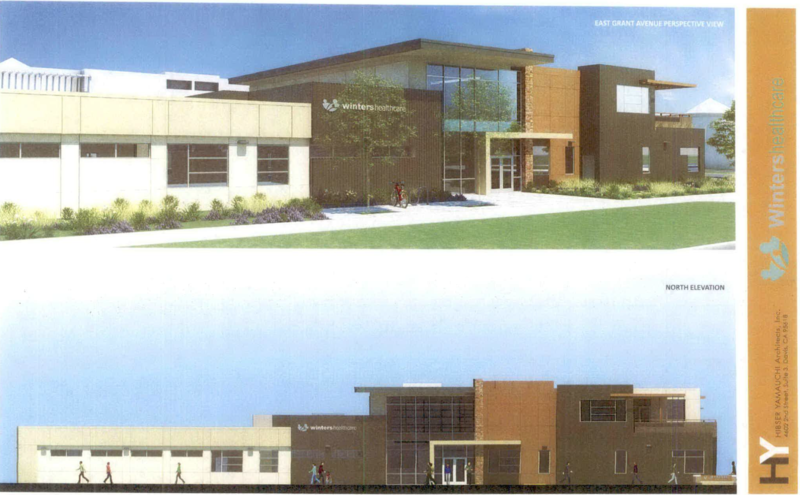 In order to co-locate services, expand access and accommodate additional patients, WHF (Winters Healthcare Foundation) will build an $8.9M, fifteen thousand square foot healthcare facility on Grant Avenue in Winters, California in the next three years. A building site was identified in late 2014. The finalized Purchase and Sale Agreement (PSA) for the property is currently in escrow. City and county officials support WHF's efforts toward co-location in a new facility. Community leaders recognize WHF as a dedicated community resource and partner. They understand that WHF provides quality healthcare services and acts as a safety net for the entire community. Yolo County has earmarked Intergovernmental Transfer Funds (I6T) to support this project, which is viewed as an investment in healthcare services that will support the growing community well into the future. The two story facility design was based on optimal staffing levels and operational statistics reflective of maximum efficiency. The building will support WHF's relationship-based model of patient centered healthcare. Nearly nine thousand square feet of space is designated for core clinical services, more than tripling the space currently available for life cycle primary care offerings. Approximately six thousand square feet of space will be dedicated to the provision of medical services while over two thousand square feet will house a state-of-the-art dental clinic. Staff work areas are designed to optimize Interdisciplinary care team interaction and collaboration. Non-clinical areas of the facility account for approximately five thousand square feet of space and include public areas as well as space for complimentary services designed to promote community wellness and facilitate access to healthcare. Administrative services, information technology, mechanical rooms and staff areas are designed for efficient use of space, preserving employee access without impact to public spaces.